The actor Kagaya Kashichi I held the name of Nakamura Utanosuke I from 1730 to 1741. Dates of birth and death unknown. His first stage name was Ogino Fujimatsu. He was recorded in the chronicles as an iroko performing under the name of Matsushima Yoshimatsu from the 11th lunar month of 1743 at the Ichimuraza. He was adopted by Nakamura Utaemon I and received the name of Nakamura Utanosuke II in the 11th lunar month of 1746 in Kyôto. He took the name of Somematsu Kosaiza in the 11th lunar month of 1752. 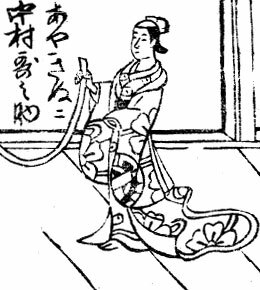 He quickly changed his name to Bandô Tsuneyo before taking the name of Bandô Tsunekichi in the 11th lunar month of 1754. No record afterwards. He was a wakaonnagata actor. A minor wakaonnagata actor held the name of Nakamura Utanosuke between the 11th lunar month of 1818 to the 11th lunar month of 1821 in Kamigata. He was never acknowledged as an official holder of the name. A minor tachiyaku actor held the name of Nakamura Utanosuke between the 1st lunar month of 1821 to the 3rd lunar month of 1821 in Kamigata. He was never acknowledged as an official holder of the name. A minor tachiyaku actor held the name of Nakamura Utanosuke between the 11th lunar month of 1826 to the 11th lunar month of 1827 in Kamigata. He was called Monjûrô before changing his name to Nakamura Utanosuke. He was never acknowledged as an official holder of the name. The actor Nakamura Tsurusuke III held the name of Nakamura Utanosuke from the 7th lunar month of 1832 to the 7th lunar month of 1848. He was never acknowledged as an official holder of the name. A minor Kamigata actor held the name of Nakamura Utanosuke between 1857 and 1867. Dates of birth and death unknown. This minor actor held the names of Nakamura Tamagorô and Nakamura Komasaburô (from the 1st lunar month of 1868 for the latter name). He took the name of Nakamura Utanosuke in the 1st lunar month of 1870 and held it up to 1903. No record afterwards. The actor Nakamura Shikaku II held the name of Nakamura Utanosuke III from November 1911 to April 1919. The actor Nakamura Utanosuke IV is the current holder of the name since October 2016.